In mid-July I spent a day with my family at Wild Water Adventure Park, or as you long-time Clovis people would say, Clovis Lakes. The park has changed a lot since I was a kid, but some things remain pretty much the same… like the big family tube ride, The Rapids. This is the first time we’ve been, that my oldest, Josiah, was not only big enough to ride the big rides, but he actually wanted to try a few. So I took him on The Rapids. First off, let me just say, carrying that gigantic raft up the hill by yourself is a tall order, but once I caught my breath and we got in the raft, I could see the excitement in Josiah’s eyes. But have you ever done something that you thought looked really fun and then in the middle of it, you realized, it’s kind of terrifying too? Well, that’s what happened for him. As we approached the drops, he realized he was going down backwards, and his face changed. His screams got louder and higher pitched. Now, of course, that made me laugh really hard because I knew he was going to be fine and that feeling when your stomach drops… that’s all part of the fun. Do you ever feel like God is laughing when you think you need saving? Now, if there’s one thing the scriptures teach us about joy, it’s that the most joyful people go through some of the hardest things before they find that joy. Sometimes you’ve got to go through it, to get to it. I hope today, if you face any fear, you’ll be able to face it head on, knowing your heavenly father is right there with you. If you can do that, you’ll find the peace and joy that surpasses any earthly understanding. 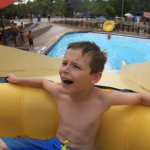 Watch Josiah’s fear turn to joy in our family vlog at Wild Water Adventure Park. This post first appeared on the Two Cities Church blog.